The ancient port city of Genoa and the Ligurian Coast made an excellent backdrop for my novel, Bloodstone Castle. It is where Pesto sauce originated from. It is widely used in Italian cuisine, but during springtime it reaches its best, and it matches salads, tomatos' salads and also pasta sauces. One of my favourite pasta recipe is Pasta al pesto. 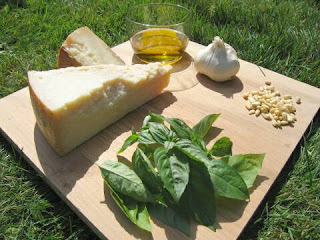 Put the water to boil and begin to put into your mixer, the garlic, the pine nuts, the grated Parmesan. As it mixes, add extra virgin olive oil until it becomes a cream. When the water boils, add salt and the pasta and set your timer for the time needed for the kind of pasta you're cooking (usually it's written on the package). 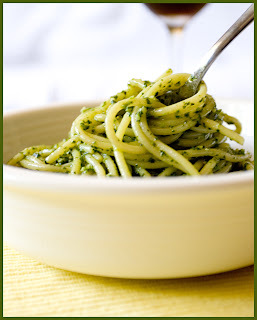 About 2 or 3 minutes before your pasta is done, take 2 or 3 spoons of the boiling water and add to your pesto. It helps it to become more creamer and easier to mix. When the pasta is done, you just have to pour it through a strainer and mix your pesto with pasta. It's done! It's healthy (you have only raw and unsaturated fat), easy and tasty! Buon appetito! Time needed: time needed for boiling the water and cooking the pasta (about half an hour or less). Pesto comes from the verb "pestare" that means pound on, referred to the pounder where ingredients were put inside and then pounded with a pestle.